The strong safety culture in all of Cameco's facilities continue to deliver sound results. Our fuel manufacturing facilities have systematic programs to identify, document and address risks and engage all workers and managers in development of a strong safety culture. These programs meet the specifications of the OHSAS 18001, an international occupational health and safety system, and have delivered excellent safety performance. The manufacturing facility is also registered under the ISO 14001 program, an internationally recognized standard for environmental management systems. This framework assists us in reaching our environmental protection goals, and allows us to demonstrate our commitment to sound environmental performance. The standard calls for annual independent audits and re-certification every three years. Beginning with the physical design of facilities, to training and equipping expert personnel, Cameco works to ensure the security and safety of our people and the local communities of Port Hope and Cobourg. Radiation protection is considered in physical facility designs, as well as operating procedures, at our fuel manufacturing facilities. Our program also provides for systematic monitoring of radiation in work areas and tracking the exposures of individual workers using a combination of monitoring devices and health testing. Consistently, radiation exposure for our fuel manufacturing workers are far below regulatory limits. 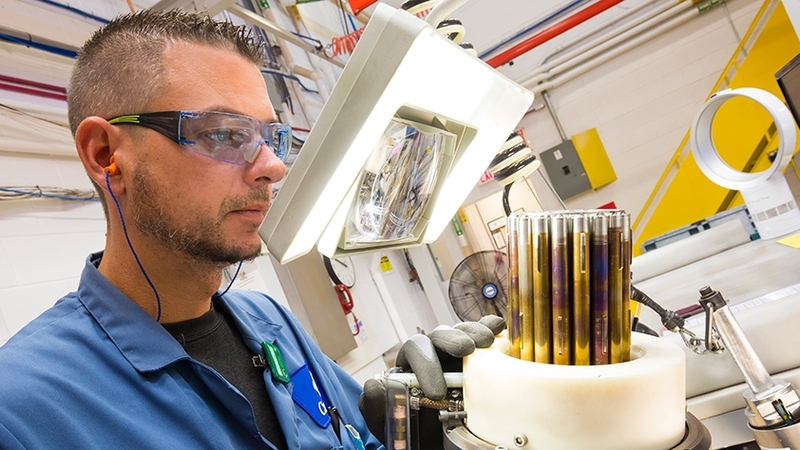 Cameco Fuel Manufacturing is regulated by the Canadian Nuclear Safety Commission (CNSC) in accordance with the federal Nuclear Safety and Control Act and regulations. In addition to receiving our regular operational performance and incident reports, CNSC staff conducts regular site inspections and audits to verify that people and the environment are protected.